“Welcome to Rory McIlroy’s Macaroni and Cheese Emporium! Where I, Rory McIlroy, personally delivers each and every bowl of Rory McIlroy’s Macaroni and Cheese to your table!” [ANNOUNCER VOICE] “Rory delivers from 3:00 to 3:12 every 23rd Wednesday.” I don’t know why but I got that stuck in my head while I played the extremely long titled EA Sports Rory McIlroy PGA Tour (Hereafter and thenceforth known as ESRMPT) but I am offering it up as a valid business idea to Mr McIlroy for the low, low cost of free Rory McIlroy’s Mac and Cheese for life. Say it out loud, it just rolls right off the tongue. Rory McIlroy’s Mac and Cheese. Gold mine. Anywho, Tiger Wood’s reign of terror over the golf video game world has come to an end and it’s time for Rory McIlroy to take over. Is ESRMPT the same old same old, a reboot, or something entirely different? Let’s find out together as we head down the road to RMMACE and have some Mac and Cheese and go over the game. Let’s get a few negatives out of the way. The big one, you can only play Match play. The only option is to play a round and best overall score wins. No best ball, no best shot, no skins, no bingo bango bongo, no stableford. OK I think I made my point. Wait, one more. No chapman. (I actually used all the ones I know in the first part. Thanks Google!) The point being a lot of these have been in previous EA golf games so their omission on this new flagship launch is disappointing and really limits what you can do in multiplayer as far as tournaments with your friends. Number 2 disappointment is there is no Masters. You do progress through the FedEx Cup and there is a mixture of real tournaments like the Players Championship intermixed with made up tournaments like the Bioware Classic. A lot of nods to EA properties throughout. But if you’re looking for a 100% recreation of the actual PGA Tour then you are out of luck. The main mode for ESRMPT is the Pro Mode. You create a player from scratch and drive, chip and putt your way through the FedEx Cup. The game is downright gorgeous. From the players to the course everything looks amazing. There are 12 (13 with a pre-order which will be made available to everyone down the line) courses and it’s a good mix of painstakingly recreated real courses and some insane fantasy courses. The highlight for me is the 18 hole executive course (all par 3s) that is based on Battlefield. The commentary alone makes this a course you need to try out right away. It seems every year golf games feel the need to come up with new ways of striking the ball. From the classic 3 point click to the left stick swing to ball shaping prior and/or during launch you are always having to remember and learn a new “better” way to play. 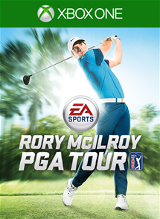 EA Sports Rory McIlroy PGA Tour has finally done away with all that offering 3 main ways to play and even including a custom option where you can pick and choose the best of all 3 to create your own Frankenstein’ed gameplay. Probably the biggest innovation is the way you play tournaments. Each tournament is played out over 4 rounds like the real deal. Four rounds of 18 holes is a LOT to play. I’m not going to do the math. Well ok I will, 72 holes per tournament is asking for burnout. So ESRMPT has a brilliant new feature. Highlight Rounds. Instead of playing all 18 holes you play a selected series of 4 or more holes and the game then simulates the rest of the round. It allows you to get a tournament done a lot faster, the downside being if you have a bad 5 holes the simulation is not going to come out in your favor. If you want to play out the whole thing you can, or highlight the first few rounds and then finish strong on your own 18 its entirely up to you. Leveling up is automated with skills and equipment unlocked at every level. The way you give a little something special to your golfer is your ability to select skill boosters. Every 25 levels you get to add another one. Things like Power Hitter or Chip and Putt Specialist. All of these come with boosts to one area and negatives to another so it’s a real strategy to decide what you need and what you can give up to get it. Multiplayer plays out in the new everyone goes at once fashion that is all the rage. Although it really speeds up play and is the go to choice now for most players I would of really liked to have seen an option to force a more traditional rules of golf mode. Brand new is the Night Club Challenge mode. This is a series of golf challenges played out over 3 courses with over a 100 challenges to do. Putting, Target Practice, Chipping, just a huge selection of things to do. This mode also adds power-ups like power bursts and sticky balls that stop instantly when activated. It’s a lot of fun to play through but yet again I am left a little disappointed because there is no way to play with friends with all the power-ups you’ve earned. Overall PGA Tour is a lot of fun and the things they got right this year far outweigh the slight misses. The complete lack of game modes to play with friends is the biggest set back but the additions to play styles and just how smooth the games plays makes it a lot of fun. I suggest you get yourself a bowl of Rory McIlroy’s Mac and Cheese and play a few round with friends today.